In small scale production, this process is done manually with sharp metallic blades (lames in French), while water jets are used in large scale scoring. The origin of scoring dates back to the 19th century, when a French scientist named Vaudry mentioned “breads with cuts on their surface” as an artful and science-grounded step for successful baking operations. Vaudry described these cuts as an improvement in the appearance of bread. Overall aesthetics of bread loaves: bakers can score bread in different ways to improve appearance. Dough structure: surface incisions create weak points in the dough skin thus reducing its tenacity or strength (i.e. resistance to expansion) especially for high protein flours. Scored doughs expand more during oven spring. Yeast activity: scoring creates paths for carbon dioxide gas to escape when the pressure inside the dough becomes too high during oven spring. Different scoring techniques can lead to variations in bread expansion and therefore its final appearance. Round loaves should have cuts that spread evenly across the loaf and open quickly. Hold the knife vertically, around 90 degrees to the loaf surface. Long loaves (batard- or baguette-type) should be scored parallel to the length of the loaf, with a shallower cut than round breads. Hold the knife at around a 30 degree angle (also known as a lip or ear cut) along the loaf surface. In high-speed production plants, mechanical scoring is done using a very fine, focused stream of water. The cut expands and opens as the loaf bakes. Timing is critical to ensure even distribution of the cuts. Scoring of dough is difficult if the dough does not have good tolerance. Water scoring can be achieved by nozzles coupled with pressurized water. Advantage of this method include the ability to score large quantities in a short period of time. In addition, the food safety aspect of water scoring is better due to the elimination of metal knife blades. One disadvantage of this method is the lack of versatility in the design of scores. Varying height of water nozzle, i.e. the distance from application point to product surface. If too long, incomplete scoring may result, thus requiring increase in water pressure at nozzles. Hardness of water. If too hard, i.e. high levels of calcium and/or magnesium salts, clogging of nozzles may ensue. Timing for splitting. As soon as the front of the pan is detected by sensors in the line’s conveyor, the water jets should engage. 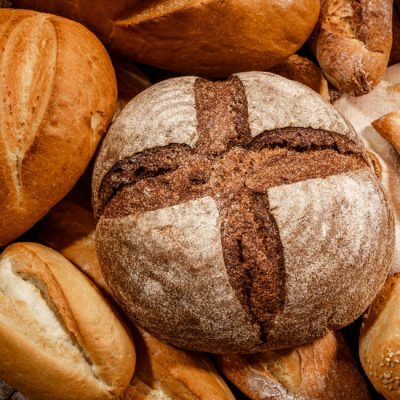 As a part of the production process, bread scoring should be part of the HACCP plan and need to be properly addressed in pre-requisite programs such as allergen changeover, hygienic design, maintenance (if automatic scoring equipment is used) and cleaning program. Suas, M. Advanced Bread and Pastry: A Professional Approach, Delmar Cengage Learning, 2009. Hamelman, J. Bread: A Baker’s Book of Techniques and Recipes, 2nd edition, John Wiley & Sons, Inc., Hoboken, New Jersey, 2013.